With a first quarter total return of 13.7% for the S&P 500 Index, 2019 has certainly started better than the prior year ended. Whereas the final quarter of 2018 was one of the worst quarters for the stock market in decades (with the S&P 500 Index posting a total return of -13.5%), the first quarter represents one of the best starts to a year in some time. Of course, the mathematically astute will point out that a 13.7% increase following a 13.5% decline does not get one back to even…but it’s an impressive start to the year nonetheless. Are things really that much better today than they were three months ago? Or were things three months ago really not as bad as reflected in the stock market? 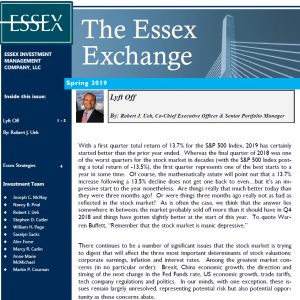 As is often the case, we think that the answer lies somewhere in between; the market probably sold off more than it should have in Q4 2018 and things have gotten slightly better at the start of this year. To quote Warren Buffett, “Remember that the stock market is….